You’ve got to feel sorry for Aston Villa season ticket holders. The team’s one win and four defeats this season has continued on from the woeful home records of the previous two. In the Premiership, currently, there are three teams with only three points (a single win) to show from their first five home games. West Ham, who Villa visit in their next game, have three points and a single win from four games. 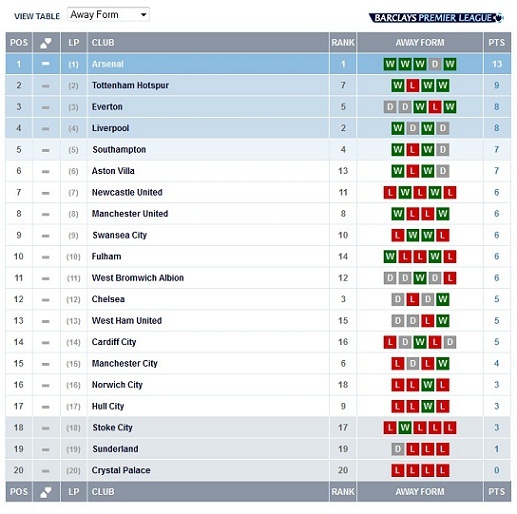 In the home form of the season so far, Villa rank 17th in the Premier League. That’s relegation battle form. Last season only Wigan and QPR got less home points than Villa. It’s a worrying trend. Having managed only five wins last season, Villa were even worse in Alex McLeish’s reign when they could only chalk up four wins in 19 games (to his credit, at least McLeish knew how to draw a game). For a team like Villa, who historically have been pretty strong at Villa Park, it’s nothing short of a home horror show. If the Premier League’s idea of the ’39th Game’ ever came to fruition then probably Villa would be the front of the queue asking for one of their home games to be played abroad. What is keeping Villa afloat at the moment is quite simply their away form. Last season, only six teams had better away records than Villa (you can probably guess them), with Villa accumulating 21 points, the same as Everton. If Villa had finished with lets say the average home form of Houlier’s Villa’s team (W8 D7 L4), Villa would have finished comfortably 8th last season above the Baggies. Again, this season, Villa would have been ever-present in the top half, if only they could at least have an average record at home. At the moment, Aston Villa away form is better than the likes of Chelsea, Manchester City and United. How and why, Villa get success away from home is no secret, they are the masters of the counter-attack, which suits the away game scenario when the onus is on the home teams to take the game to their visitors. This trend of Lambert’s team mirrors the philosophy and make-up of Martin O’Neill’s Villa team. In the last two seasons of his reign when Villa finished sixth both times, the team recorded more away wins than at home. If you think Delph was bullied last week then you are an idiot Delph completely snuffed Barkley out the game until Barkley went off, like most of the idiots that show up at Villa Park you’re fickle, no wonder we’re better away, the away supporters are the true die hards who’ll do anything for the club, where at Villa Park you get the prawn sandwich brigade turning on you when you go a goal down. As a ST for the last 9 years I can fairly say I’m sick to death of the poor home form, all accumulating in me walking out of VP after Everton scored their second yesterday. The argument of ‘playing the big teams’ can be used, but if the formation/tactics were right we wouldn’t have to use the argument; playing 4-2-3-1 against Everton left Westwood, every time Delph went forward, getting bullied by Barkley and Co. I think most teams fancy their chances at the moment coming to Villa Park for sure. Villa need to go on a decent run unbeaten at Villa Park to restore some faith. The buck does lie with the midfield. We haven’t had the most creative of midfields for a while now, so if teams park the bus or have a solid midfield, it always proves difficult for Villa to dictate terms or offer any cutting edge. It is generally accepted we turned it all around in February last season and became a team. We’ve played 12 home league games since then. 7 of those have come against Man City(2), Liverpool(2), Chelsea, Spurs and Everton. In the other 5 we have won 3 drawn 1 and lost 1. We are an inexperienced team with a lot of pace and not a lot of creativity. It is not remotely surprising we are finding it difficult to get results in home games against top quality opposition. But we are doing just fine against the teams around us. We have played 5 home games and already 4 of last seasons top 7 are out the way. That leaves just 3 left for the whole rest of the season. We are better away than home and that will continue for some time, but I am convinced we will see an improvement in our home results over the coming months because the fixtures will be significantly easier. Precisely. We play home to Cardiff Sunderland Palace and Swansea before new year. If we are still struggling for wins after that then that would be cause for concern and we can address it in the January window. But I think we will get on a roll and prove a few people wrong.